Retractable pens, enquire today to see how much you can save. Twist action branded pens, home of the best selling Espace extra! Go green, literally! 80% eco friendly pens and pencils, all at an outstanding price. If you are keeping within in a tight budget then this range will be ideal for you. High quality metal corporate pens at the best prices. Looking to give the very best impression? Executive printed pens would be ideal for you. We even have a category dedicated to frosted pens, all at the lowest prices! We have separated our Transparent range to help you to find the best suited product. Choose a FREE sample so that you can make sure you find the softest pen for your fingertips! Our promotional pencils are available to you at the lowest prices. Promotional highlighters, call or emails us today to see what we can offer. Choose a range of packing options for your promotional pens. Coming soon. Businesses in the UK today are looking for every way possible to gain an advantage in creating public awareness about their services and products. For this reason, businesses spend a lot of money on various marketing schemes and promotions. These can include advertising campaigns using traditional media, as well as promotions online. Some businesses find that it is helpful to use traditional methods of promotion that include the distribution of items, such as calendars, T-shirts, mugs, caps, and promotional pens. Promotional pens in the UK have some advantages that make them an ideal method to increase brand awareness. As a business, it’s important to not only grab the attention of customers towards your products and services, but also to create a lasting impression. Not every person will feel comfortable wearing a T-shirt or cap to promote a business. In addition, the cost of using printed T-shirts and caps for business promotion can be prohibitive. Pens can be printed with a promotional logo and message for a relatively low price. Business promotional pens are practical items that will be gratefully used by those who receive them. A promotional pen that has been printed with a message about a business will be used frequently and the message will be seen by anyone - from the family members of your customers, to commuters who get lucky enough to attain a new pen on their dreaded journey to work. These promotional pens make great gifts that can freely be given out to members of the public because of their low cost. A business can have a substantial supply of promotional pens available in a prominent location and they will be picked up by customers, as well as casual visitors. For this reason, it’s useful to have a clever slogan and an attractive design. This is more likely to draw the attention of those who see and use these pens. In comparison to other forms of advertising to establish brand awareness, an investment in promotional pens that are printed with a business logo can be significantly lower in cost. A business can use these pens very creatively as part of special sales days, customer appreciation days, and promotional contests. They are ideal items to take to a trade show where there will be huge amounts of foot traffic. The advantage of giving out pens over other forms of promotional materials, such as advertising brochures, is that most brochures will soon end up in the bin, but pens will be used for months, perhaps even years! It’s a marketing tool that just keeps on giving. Each time people see your promotional pens in the UK, they will be reminded of your business. The next time they need your particular product or service, they are likely to remember your slogan or logo subconsciously and will turn to your business first. So with that being said, it comes as no surprise that many businesses exhaust all of their marketing options quite quickly and find themselves at the end of their marketing budget without even really scratching the surface. Less traditional methods of marketing, such as paid advertising and PPC, can wipe out an entire month's budget in just a few days, which is why promotional pens are still a timeless method that provides results. There are many businesses out there who shun new-age marketing methods in favour of the traditional approach of advertising - giving away promotional products, such as mugs, calendars, caps, T-shirts and pens. Though admittedly, the cost of manufacturing t-shirts in mass will certainly be higher than that of promotional pens. Getting your business’s logo or tagline printed on pens is a relatively inexpensive option. Why Pens Are The Ideal Promotional Gifts? Promotional pens in the UK are still all the rage amongst the majority of businesses, especially the ones who are looking to advertise themselves. Not only are promotional pens affordable, but they are also a cost-effective way to spread awareness about your brand among your targeted audience. 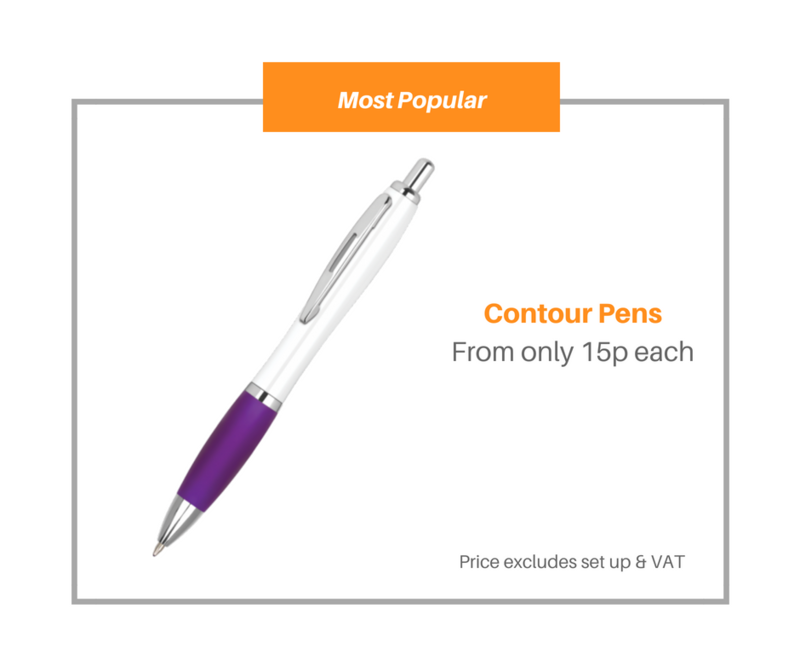 As a business, if you’re looking to purchase a promotional product which is easy on your pockets as well as useful, then pens are just what your business need! Products that can be used on a daily basis are perhaps one of the best items to give as a promotional gift. It is not as if we’ll ever be living in a world where pens aren’t required anymore. We’ll always need them to complete essential documents or to sign contracts. As long as we need pens, gifting them is by far the greatest promotion medium for your brand. If you provide your audience with quality promotional pens, they’ll always be exposed to your brand, which will ultimately mean that your company’s name is forever etched in their minds. When giving away promotional products, portability is a crucial factor that every business must take into consideration. A promotional item is considered best when it can be carried from one place to another without any difficulty. And you can be sure that’s the reason why promotional pens are so commonly used by brands to advertise themselves. Also, the essential quality of being able to carry it from place to place at all times is what gives these pens an added advantage when compared to other products. Promotional pens are known as the backbone of integrated marketing and have been used successfully for decades. Moreover, several researchers have also found that promotional pens, when compared to other products, have managed to not only engage potential customers and reinforce a firm’s brand, but that they have also created a lasting impression. Be it an existing or potential customer, promotional pens certainly trigger stronger engagement and increase the odds of these individuals coming back to your brand for more. Why Businesses Must Use Promotional Pens? Since pens are practical and required on a daily basis, they’re just what your business needs when it comes to promoting your brand and spreading awareness amongst customers. As a business, you can have a considerable amount of promotional pens available in well-known locations and as people carry their pens wherever they’re headed, it’s a given that more and more potential customers will be exposed to your brand. Promotional pens are definitely a marketing method that will provide you with the return on investment (ROI) you’re looking for. At Supreme Pens, we pride ourselves on our ability to provide businesses with the right product, all whilst delivering exceptional customer service. Providing our customers with a cost-effective marketing solution is at the forefront of every transaction we make. Having gained 30 years of experience in this field, we deliver high quality advertising products, at a price that won’t hurt your business. At Supreme Pens, we have a dedicated customer support team who provide PDF visuals of your desired order before going ahead with printing. This is to ensure you’re happy with how your promotional pens will look once you’ve gone ahead and made the order. Over the course of time, we’ve found that because our service, price and delivery has always surpassed our customers expectations, we’re the go-to option whenever it comes to getting promotional products for a business. Get in touch with our friendly team today to access affordable, but effective marketing products for your growing business.